The first time they've ever flowered together! looks lovely, didn't think the flowers were that big. Yes,it's going to grow (slowly) into a large tree! 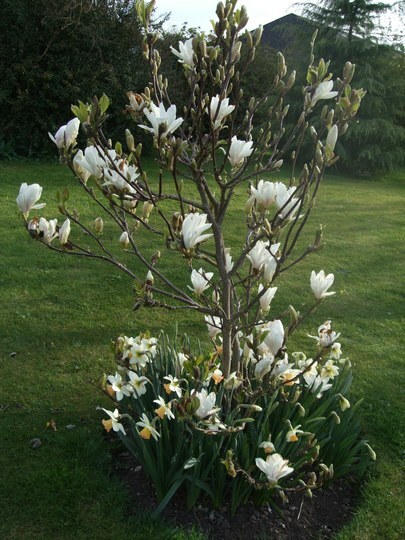 I love Magnolias - especially the white ones. They are, I agree - in the gardens on the way into town, they're just fantastic! Thanks, Holly - it might be the first and last time I get to see them flowering at the same time! Really lovely. I thought there would be some all at once spring shots over there this year. A welcome sight these two performing together. I wondered - but it could just be that it's one more year older, couldn't it! Hm...maybe another winter like the last will tell ! On the other hand...lets go with the age theory !! Ditto ! We almost did !!!!!! You were almost FORCED to, weren't you? Yes...under piles of snow for weeks on end ! Shudder...a distant memory now...thank goodness ! I shall watch the latest forecast at 10.35 after reading the paper today. Not good, although only a short period, apparently. Let's keep our fingers crossed. Thanks Spritz..will check it out on the news too...thanks....last thing we need though ! I have neutral soil, Flori - and you can see that mine is thriving! i agree - I don''t think they appreciate being moved. I've been lucky this year, haven't I, to see them flowering at the same time. Well, we needed a 'boost', didn't we!